Kathy lives in Houston with her husband Bill. 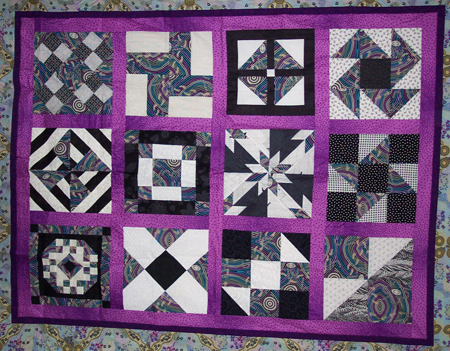 She has been quilting for over 25 years and is a member of the Quilting Queens. Kathy loves to quilt and, in fact, retired from the working world 7 years ago so she could "just quilt". This quilt was a group effort. The ladies in the Sew Sat Bee each put fabrics in a box and passed it around for each to make a block for the owner of each box. The blocks were mine at the end of the year. Kathy put them together with the purple to spice them up.